I loved this book. The growth of the investment fund, SEC audit and investigation and the outcome that feature in the book are convincing. John Howell clearly has a very good knowledge base of corporate finance and its rules and regulations and the story rang true to me. The book comprises of two story lines that run parallel. One is the tale of a successful football star who turns his hand to running and investment fund, with some brilliance but, possibly, with to much trust and a lack of understanding of some of the technicalities. I though John Howell showed a very sound knowledge of computers and electronic trading and the associated risks. The second story line is that of enduring friendship between two boys thrown together by life’s circumstances. John was skillful in describing the personalities of the two friends and how they both relied on each other for support as they traveled their chosen path of university and football. There is an interesting twist to this friendship that results in Greg moving on to stardom on his own. There is also a bit of a romance in the book as Greg meets and courts his eventual wife, Terry. The effect of great financial success on their relationship and children is intriguing and it leaves you wondering about the natures and intentions of some of the characters right from the beginning of their entry into Greg’s life. 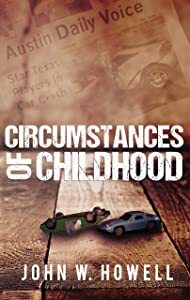 A fast moving and exciting story, I rated Circumstances of Childhood five out of five stars.